Lock in a great price for Crowne Plaza Sohar – rated 8.2 by recent guests! thanks for friend in reception who help me and give me comfort night , and I think the hotel was very good for who want set in a-range in this are I mean Sohar. Breakfast was perfect and location was good easy to find, will go there again. The staff were super nice. We had lots of pigeons visiting our balcony so my small toddler was happy and entertained. If you want food delivered from outside, you can order from Hungry Bunny, Dominos, or New York Grill. The pool was beautiful. The small bowling alley wasn’t busy when we were there. Breakfast had good options. Fresh pancakes, yogurts, fruits, cheeses, cereal, yogurts, pastries and breads, eggs, potatoes, mushrooms, etc. Everything was perfect..Front desk guy Mr Saif was very nice n professional. clean rooms, beautiful swimming pool, reasonable price. Crowne Plaza Sohar This rating is a reflection of how the property compares to the industry standard when it comes to price, facilities and services available. It's based on a self-evaluation by the property. Use this rating to help choose your stay! Elegant 5-star hotel offering modern rooms, with flat-screen TVs and balconies. It is 5.6 mi to Sohar Economic Free Zone. It features a large outdoor swimming pool. Crowne Plaza Sohar offers clear views over a natural reserve from its spacious guestrooms. All rooms are equipped with free WiFi, a work desk, sofa and satellite/cable TV. Tea and coffee making facilities are provided for your convenience. There are 2 floodlit tennis courts and a 4-lane bowling alley. Guests can use the fully-equipped gym or relax with a massage in the spa. Facilities include a steam room and sauna. 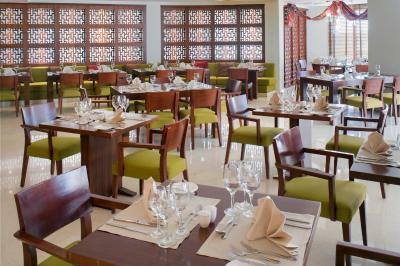 The Crowne Plaza offers a great choice of dining options, including a Mediterranean cuisine. A rich buffet breakfast is served in the main restaurant each morning. For lunch and dinner, there are 2 restaurants and 2 bars to choose from. Sohar Corniche and city center is 12 mi away, accessible by taxi from the hotel. You can visit Sohar Fort and Museum which can be arranged by the hotel. This property is also rated for the best value in Sohar! Guests are getting more for their money when compared to other properties in this city. 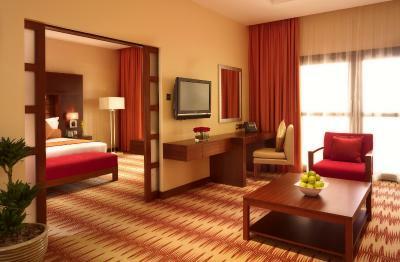 When would you like to stay at Crowne Plaza Sohar? Featuring a balcony, this air-conditioned room has a seating area with a flat-screen cable TV, a mini-bar and a private bathroom . This room overlooks the pool. Air-conditioned room with a balcony and private terrace. It has a kitchenette and a seating area with flat-screen cable TV. Interconnecting rooms are available. Air-conditioned room with a slide door balcony with a view. It has a small seating area with a flat-screen TV, a mini-bar and a workstation. Air-conditioned room with a balcony. It has a mini-bar and a seating area with flat-screen cable TV. Featuring a balcony, this air-conditioned room has a seating area with a flat-screen cable TV, a mini-bar and a private bathroom. Please note that bed type requests are subject to availability. Emerge from the desert into the lush, manicured gardens at Crowne Plaza Sohar. Subtle Arabic motifs punctuate our soaring, four-storey atrium as it rises in marble to a light-filled dome. Check in and make your way to our spacious swimming pool, relax by the poolside bar and at the sun deck. Saunas and steam rooms await in our luxury spa, or you can loosen your tie and challenge friends in our bowling alley. Crowne Plaza Sohar is nine km from Sohar Free Zone near the Port of Sohar as well as Sohar Industrial Estate and Sohar Airport. Speak to our friendly Concierge about arranging a limousine pick-up from Muscat International Airport or Dubai International Airport, both about two hours' drive away. Or take a trip to Nizwa, Oman's ancient former capital and home of date-growing. House Rules Crowne Plaza Sohar takes special requests – add in the next step! All children under 16 years are charged OMR 9 per night for extra beds. Any additional older children or adults are charged OMR 9 per night for extra beds. Crowne Plaza Sohar accepts these cards and reserves the right to temporarily hold an amount prior to arrival. Hotel is reachable by either car or plane. Transfers to and from the airport (Muscat or Sohar) are available upon request. Please contact the hotel for further information. Please inform the Hotel in advance if you require an airport pick up and drop off. Poor customer service I waited for more then an a houre to get my second room, I called them since I was in MCT.However,the Room was not yet ready. I additiona ,I ask to Empty the Maine bar the took almost two hours to come after repeatedly calls . At the time of check out I have been advised if I can Check out early!!!!!!!! I ask the front desk staff to ask has manager to contact me but till now no any call from them. The pool area/bar needs updating. Food apart from the steak house was poor. The meal in the steakhouse was delicious. Staff through out the hotel were very helpful. The doors inside room smelt of hair coconut oil. Spacious room with balcony. Big bathroom with tub. Swimming pool, gym facilities are nice. location as it is close to industrial area and airport. The room has no view. at least the one i was allocated. But still value for money.I think we should have asked for options before getting in the room. As the hotel did not looked full. everything was on spot during my night there.